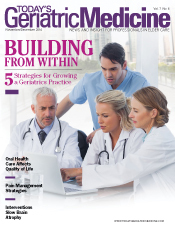 Developing a thriving geriatrics practice that is both professionally and financially rewarding depends on calculated planning and specialized strategies. Specialized interventions can maximize cognitively impaired patients' ability to control cognitive and functional demands to the greatest possible extent. The association between oral infection and systemic disease warrants particular vigilance in monitoring older adults' oral health. 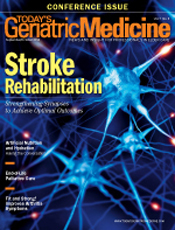 Individualized treatment, focusing on reorganization in the recovering brain; a multidisciplinary rehabilitation approach; goal setting; and use of community therapy resources, is key to successful stroke rehabilitation. The specialized program, combining structured physical activity with health education to build self-efficacy and effect behavior change, helps to reduce lower extremity joint pain. Physicians need to effectively communicate to patients and their families the realities of nutrition and hydration options in end-of-life care. Providers must explain the potential risks and limited benefits of artificial nutrition. Fewer than one in five recently polled obstetrics and gynecology residents received formal training in menopause medicine. 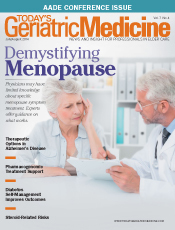 Other physicians feel similarly ill equipped to adequately treat menopause symptoms. Experts discuss strategies that work. Physicians must discuss with patients and caregivers the available options using medications to treat Alzheimer’s disease, including their limited clinical benefit, adverse side effects, and associated costs. Pharmacogenomics identifies information about a patient’s own genetic makeup, or genome, and then selects the drugs and drug dosages most likely to work for that individual. The process allows physicians to choose medications specifically suited for a particular patient. Diabetes self-management programs help patients learn how to manage their disease through appropriate monitoring, medication adherence, diet modifications, and beneficial activity. 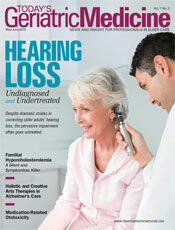 Despite dramatic strides in correcting older adults’ hearing loss, the pervasive impairment goes largely undiagnosed and untreated. Creative arts therapies such as music, art, or drama and holistic modalities, including yoga, visualization, breathing, aromatherapy, and Reiki/massage, can improve Alzheimer’s patients’ quality of life. Because familial hypercholesterolemia predisposes affected individuals to heart attack and stroke, identifying and treating this silent killer are critical. 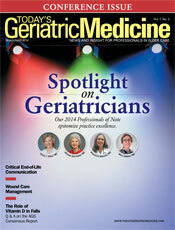 Today’s Geriatric Medicine highlights geriatricians nominated by their peers for their practice excellence. Interdisciplinary wound care management practices attract partnerships with referral sources and reduce the potential for wound-related litigation. Experts provide guidance on vitamin D supplementation. Providers must help direct end-of-life treatment decisions and facilitate patients’ and/or families’ choices via compassionate communication. Professional teams enhance care and outcomes by improving access, continuity, patient self-management, disease management, and coordination, resulting in care delivery that optimizes the contributions of every team member and enhances efficiency. Individually tailored balance and strength exercise programs can effectively reduce older adults’ rates and risks of falling. 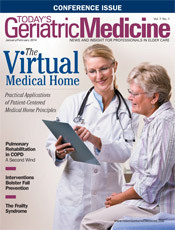 Physicians must understand the importance of identifying frail elders and the specialized treatment they require. Pulmonary rehabilitation can dramatically improve COPD management and substantially improve patients’ quality of life.